People around the world use Google Images to find visual information online. Whether you’re searching for ideas for your next baking project, how to tie shoelaces so they stay put, or tips on the proper form for doing a plank, scanning image results can be much more helpful than scanning text. Today, we’re sharing more about new changes to Google Images to provide even better visual discovery with more context on the image results page. By adding more context around images, results can become much more useful. Last year we started showing badges (like “recipe” or “product”) on certain results to aid in the discovery process. Since then, we’ve also added the website’s domain URL for each result to show you where the image is coming from. 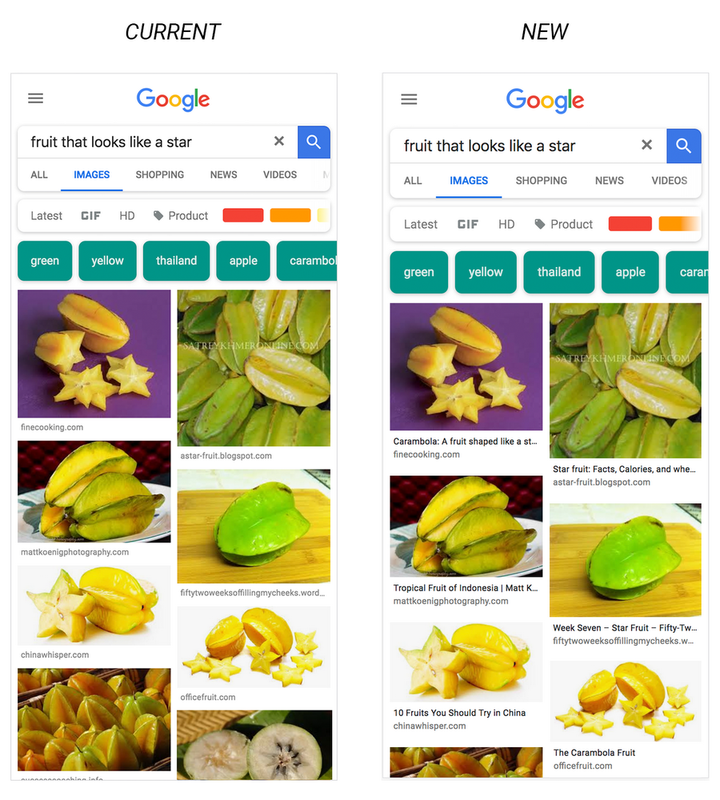 In this example, the image results give you visual confirmation that you found the right fruit, but captions make results instantly more useful with additional context. For instance, you can learn that this fruit is called carambola or starfruit, and that it’s popular in China. This also helps you choose the result page to click and explore further. This update underscores our ongoing goal to make Google Images an ever more useful tool to discover and explore more information from the web. Image captions are starting to roll out globally this week on the Google app (Android and iOS) and on mobile browsers.